Concerning policy-making in tourism and searching for innovative initiatives that determine the current touristic model, new ‘smart’ policies and initiatives have been suggested without considering appropriately a dialogue that embraces the different stakeholders. Such ‘smart’ technological solutions and the emergence of the so-called Big Data, being the essential tools to start new manners of knowledge generation, not always have been focused on the necessities and usability. 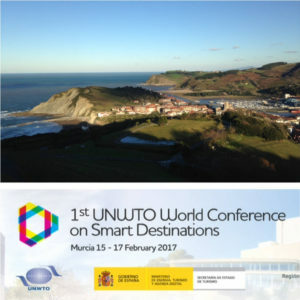 In the context of the Basque Country in Spain, in order to understand the challenge and to suggest an experimental implementation considering the inter-independent and diverse opportunities between the different stakeholders, a dynamic strategic intervention has been suggested in the coastal town of Zumaia. At present a turning point and urgent policy response is required regarding the exponential increased of visitors due to two factors: first, UNESCO awarding the Basque Coast Geopark due to the geologic landmark called ‘Flysch’, and second, the exponential and rapid growth of the local, national and international visitors in the last years as a consequence of the super-production of the worldwide wellknown cinematographic serie called ‘Game of Thrones’, among other international and national blockbusters.